At the crease, begin to diffuse the color up toward the brow bone, but don't go all the way up to the brow. Highlight the brow bone with a satin shadow color that's a shade lighter than your skin tone. If you don't have a crease and you'd like to or you have a crease on one lid but not the other, you can use eye shadow to create the illusion of one. Choose a matte eye shadow that is two or three shades darker than your skin tone and sweep that across the lid in a windshield-wiper motion where a crease would be. Fill in underneath with a matte or shimmery color of your choice. 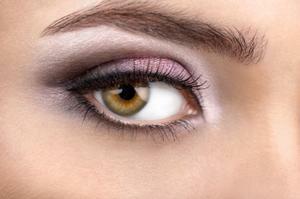 Never use a dark shadow on the lid if you want to counteract deep-set eyes. Instead, opt for a shimmery light or medium-tone shadow for the lid, then blend a darker color just along the outer edge. If you want a crease color for extra dimension, choose a medium-dark tone and be sure to blend it up and out of the crease so that it won't disappear when your eyes are open. If you really want to make a statement with your eye makeup but you don't have a steady hand, a couple of hours, confidence in your blending abilities, or the patience to freehand a design yourself, you can always opt for press-on shadows like Color on Pro. These come with a design intact. Designs range from relatively tame but beautifully blended to wilder looks, like animal print and application is simple. Peel the backing off of the design, press it against your lid, and rub. Once you remove the card, you'll set the shadow with powder. Whether you're perfecting your smoky eye or trying out a new press-on design, it's always best to practice before a big event. You'll be able to find the designs that complement your eye shape and facial features the most, merging techniques from multiple application methods when necessary.